Finishing an article on a Death Valley ride I contacted the woman I wrote about. Our group had met her briefly in Shoshone, CA. I called her to confirm what I’d remembered about our conversation. 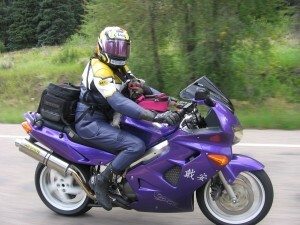 She sent me this photo of her riding the purple VFR which will figure in the article. Frequently her dog, Diddle, rides along with her and her boyfriend on their rides. Notice the doggie goggles! Tagged Death Valley, doggie goggles, dogs on motorcycles, Honda VFR, Motorcycles, Shoshone. Bookmark the permalink.